SIGforum.com Main Page The Lair What's the deal with DiNozzo's Sig? Is this for blanks or is it a 22lr? I have a P226 just like that, but with a red cap at the muzzle. Like an airsoft, but I forget the brand I have. NY, NJ, MD & CA Compliant, only fires farts. I know they often use constricted barrels for use with blanks. Allows enough pressure to build so the slide can cycle properly. I've always thought it would be a fun job to be the gun wrangle on a TV or Movie set... the person in charge of the guns and making sure everybody is safe. That's interesting to know (kkina's post). My thoughts were they modded an Airsoft SIG to use as a studio prop instead of springing for a non-firing training duplicate, painted black. But yeah I would love to do that job. Brandon Lee was killed filming a scene that used a revolver. The gun wrangler, if there was one, fucked up big time. The armorer was let go as a cost saving measure. The prop guy was handeling the weapons and failed to clear the weapons after a scene. There was a slug lodged in the barrel of a Model 29 Smith and they use those supercharged blanks for the shot were he was at the conference table. The rest you know. That was an incredibly tragic chain of events. Being a revolver, they showed it loaded or being loaded so they used cartridges that had the powder removed but inadvertently left the primer. At some point the primer was struck and sent the bullet just far enough ahead to be caught in the barrel. Next a blank was used and the powder propelled the bullet down and out the barrel. I watched the special features on the Taken dvd, back when that movie first came out. They talked about non-guns a bit, blank-firing guns, and then they talked about "flash paper" guns. The blank-firing guns used in hollywood still work, but just fire blanks. 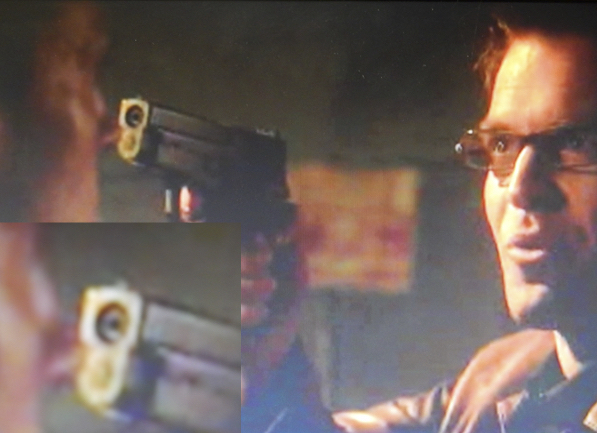 (watch the Matrix, and you can often see the crimped cartridges of blanks being ejected out of the handguns). But blanks are still dangerous in close range, so they invented the "flash paper" guns, that give a similar muzzle flash to the blank-firing guns, but can be used in the closer-quarters combat scenes of Taken. I wanted more info about it all, but at the time couldn't really find much more about it. there's a lot more about non-guns and flash paper guns being synonymous nowadays, and it looks like there's a ton more youtube videos and blog posts about prop guns now. Quick Reply to: What's the deal with DiNozzo's Sig?